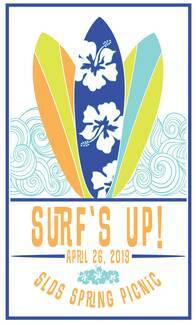 Welcome to the signup genius page for the 2019 SLDS Surf's Up Spring Picnic. We have many opportunities and venues for you to sign up. If you cannot work an entire shift, please sign up and let us know in the Notes section. Thank you so much for helping make the Spring Picnic a success! We (child and I) usually do not arrive to St Luke's until about 9:30 so I will come assist after dropping them off at class. Might need to leave a bit early but ready to help! filling ice chest, setting up food display, etc.